Sometimes there is not enough to make ends meet. During the winter, many living expenses go up and often make it difficult for families who are struggling to make ends meet, let alone stay warm. Peninsula Light Company can help. Our Project Help program is designed to help income-qualifying families with up to $200 of support each year. The program provides funds through a partnership with Key Peninsula Community Services to offset those who need assistance with their electric bill. Project Help operates annually from November through April, when electric bills are at their peak due to seasonal temperatures. The economy is still hurting, and the need continues to rise. We are looking for additional support from the community. The best part is, we will match your donations dollar for dollar. The round-up campaign is the newest way members can contribute. On average, those who enroll will only add about $6 to their annual bill. Those donations can go a long way to help neighbors who sometimes have to choose between food and heat. Since last year, more than 1,400 people have signed up to donate funds, bringing the total number of supporters to about 1,750. Our goal is to encourage 10,000 of our members — one-third of our service area — to sign up for the Project Help Round-Up campaign. You can help by make a donation to Project Help or calling our Member Services Department at 253-857-5950. About 550 Gig Harbor-area families have benefitted from an annual average of $110,000 through Project Help since 2009. Yet the program needs more funds because the demand is on the rise. No administrative costs are deducted, and all contributions are tax-deductible, so every dollar goes to help your neighbors in need. 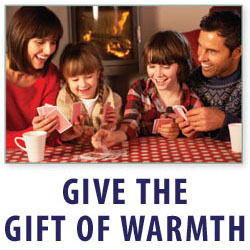 If you need help paying your winter heating bills, please call our Member Services Department at 253-857-5950.